Although this machine won the D1 series championship in 2002, it failed to acquire any points in the 2004 season. But suddenly in the 2005 season, it made a colossal comeback by winning the 2nd round! In the 6th round, he also made his way up to 2nd place, reeling in 45 points to rank 7th in the series. The machine had revived from its 2004 season slump. Check out Japan's best drift spec hachiroku, and how Ueo had tuned this machine to its success. For the 2004 season, the drifting spirits were not exactly looking over the AE86 platform like they were in the 2002 season. The fact that Ueo's performance level had decreased, resulted in a shocking empty points for him. The whole industry was concerned that Ueo's skills were slowly beginning to diminish. Ueo finally discovered the cause of all his demise during the 6th round. While inspecting a body panel that had a layer of paint peeling off, he discovered that the rivets used to strengthen the chassis had become stretched. Since there were holes drilled into the body for this modification, the entire vehicle was absorbing flex much more than at its stock form. When this occurs, the vehicle will not perform the way the driver commands it to no matter how effectively the suspension is set. Because of this, Ueo switched back to his first machine which already had a stitch welded chassis; a much tougher method than a riveted chassis. Using the time taken off from the 2005 season opener, Ueo shaved off 30kg of weight off the first machine by cutting off unnecessary metal components. Miraculously, he took the victory stands on the next round. This proves that the only problem of his machine was the body. 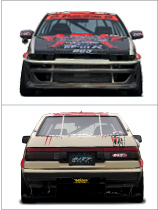 The tires and the suspension were all up to par and the 1st version AE86 performed very well in the 2005 season. Ueo had once again retrieved his original driving style and managed to secure a seeded seat that season. One of his most unforgettable achievements was at the D1 7th round, achieving a perfect score of 100 points, 3 solo runs in a row. Revealing the secrets to the Ueo style! Ueo's style of drifting has amazed us all. The deep, almost impossible angles produced from his machine, to the unbelievable velocity the car is taken can only be achieved by his balls-out, full throttle runs. One of the secrets to the fact that Ueo hardly ever spins out is in the front tires. Since his debut, Ueo had always used 14 inch rims with 185 spec tires. Using these tires will make the car very difficult to grip the pavement. The key setting in this setup is when the machine is drifting and the throttle is depressed, the front tires begin to slide as well. As result of this, when the countersteer is maxed out and the drift angle is at its peak, the vehicle still resists spinning out. If wider tires are installed on this setup, the deep angles that are currently exhibited would not be possible. The quickness of the execution of these angles is another key factor. Ueo claims "It's not the machine, it's the driver". The secret is in the way the vehicle load transfer is managed after switching back the angle during a drift. Applying load to the opposite side of the suspension, the angle is swung around during switch back by using the force of repulsion. The important thing to know is not to put too much stress on the suspension during that maneuver. Let off the gas before it gets to that point. No matter what the vehicle is Ueo can maneuver the car in this style by using this technique. When we asked how he rounds the turns at full throttle, he simply responded "By using a machine that you fully trust". Aside from all the physically defying moves Ueo does, he is after all, human like the rest of us. It's plain physics that his car must slow down at a certain point in order to make it around a turn. But when the vehicle can be controlled when and where it should stop, then the driver is then now able to keep on the acceleration longer. This creates the illusion of Ueo rounding the corner at full throttle. A new machine in the works for 2006! Ueo's distinct and masterful driving techniques have been proven to be the root of his drifting style. However, in order for him to exhibit this style, the vehicle has to be setup a specific way. The chassis is the first key point. Ueo claims "Unless the chassis is stiffened, I cannot get enough traction and the shocks can't be properly dialed in." However, the chassis is not over-stiffened in case of wet conditions. Then there is themotor. The engine is set to produce a flat torque curve. In 2004, the engine was built to rev up to 13,000 rpms but the shifting point was reduced after discovering that the torque was not able to keep up that high in the range. The ideal shift point now is set at 9000 rpms. The rev limiter still remains disabled in case of those times where Ueo needs that extra revolution. Lots of research went into the suspension. Basically, Ueo wanted a spring setup that did not bounce or have that springy feeling to them; therefore a softer spring rate had been chosen. But he knew that if the springs are too soft, he wouldn't be able to display an aggressive driving style so moderately stiff (but soft) springs were carefully chosen. The shocks are still being researched. Ueo is searching for a set of shocks that benefits the vehicle in stopping. He claims that shocks that "are hard but soft" are the perfect kind. Ueo plans to release a third version of his vehicle in the 2006 season. The expected AE86 will weigh 50kg less than the second version. "The engine mounts have been relocated as well as the gas tank to shave some weight. The vehicle should be ready before the 2nd round." Claims Ueo. 160 HP quad throttle setup good for 10K RPMs! From 2005, Matsumoto Engine has been building Ueo's motor. Currently a low profile camshafts has been installed to match the large ported head. In the 2005 season, they had made a mistake of installing high lift camshafts, resulting in a greatly unbalanced engine. The current 2006 engine had been perfectly balanced. An AE101 stock individual throttle body setup has been adopted. Since the head has been modified to a high port, the custom DG-5 intake manifold had been raised 1 cm to make up for the change. Ueo usually prepares 2 or 3 trans-missions for the D1 races. They all vary from a normal unit, 3rd gear close geared, 5th gear close geared, etc. Ueo calculates the gears on a special software according to the circuit before every race. However, Ueo claims that he most often uses the stock transmission the most. Custom DG-5 coilovers! Rear coilover conversion! The tension rod and the entire rear member have been modified with Cusco products. The coilovers are custom DG-5 units. The rotors, calipers and the pads remains stock since this vehicle cannot gain tremendous speed. The brake booster has been eliminated. There are 6 different final gear units to choose from. The LSD is set according to each and every course. The rear suspension arms are currently full pillow ball units but they plan to swap them out for semi-pillow ball units with strengthened bushings. By doing this, Ueo claims that he achieves more traction, and can also cover up his mistakes while sliding. The rear suspension had been swapped out for coilover units for easier maintenance. The bracket below connecting the control arms had been relocated for increased traction. The hoses are adjustable to assist the increased stroke of the upper and lower arms. The Stitch Welding plus a bolt-in roll bar! The entire main gauge panel had been redesigned including the tachometer, oil pressure, water temp, and A/F gauges. With the use of P-Lap, lap times can be logged in after each run. The bandanna on the steering hub has been Ueo's style since the 2001 season. The stitch welding (spot welding) and the roll cage installation had been performed personally by Ueo. By utilizing his past experiences, the main frame had been the focus of the stitch welds. The roll cage has not been welded in for the chassis stiffness adjustability during wet conditions. The battery and the fuel cell have been mounted behind the passenger seat. A simple, non-widebody style! Strict racing setup! During battle, the Car Boutique full aero kit is sported on the vehicle excluding the rear bumper. The front fender is a no-name brand component bought off an internet auction site. Ueo claims he is constantly looking for cheap and effective parts online. The rear fenders had been modified to house wider tread tires. The tread width is meticulously set by exchanging wheel spacers.